This hotel is situated in the peaceful Ovacik district with an outdoor pool and air-conditioned rooms, between the pine forests and surrounding mountains. The hotel offers a private area at the beautiful Oludeniz Beach, just 3 km away. At Red Rose Hotel, all rooms feature a private balcony with pool or garden views. Each room is equipped with a satellite TV. Free Wi-Fi is also provided in the rooms. There is an à la carte restaurant at Hotel Red Rose, serving Turkish and international cuisine. Guests can enjoy their meals next to the pool. Red Rose Hotel is located in a quiet area, an 8-minute walk from the town centre. There are many restaurants, bars and shops nearby. Dalaman Airport is 62 km away. There is an outdoor swimming pool and bar, snack bar and breakfast room. Guest can take advantage of the laundry service (local charge). There is satellite TV and safety deposit boxes are available (local charge), air Conditioner is also available at an extra cost. *****The Hotel is modern, simply decorated and clean. All the rooms are furnished with, wardrobe, dressing table and bedside cabinets. 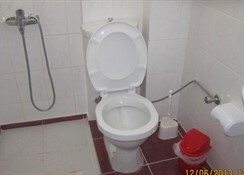 Each room has a telephone a balcony with a table and chairs, bathroom(shower only) and toilet en-suite. The Red Rose is a small and friendly family owned hotel where you can relax and be treated like one of the family. The hotel is nestled in the beautiful pine clad mountains overlooking the sea at Olu Deniz. 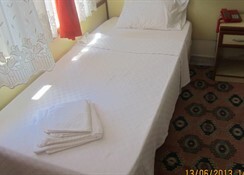 It is in a quiet area just 8 minutes casual walk away from the centre of Hisaronu. The Red Rose Hotel is situated in the Ovacik area of Fethiye, about 1 hr drive from Dalaman Airport. Olu Deniz with its world renowned beach is 3 km away. 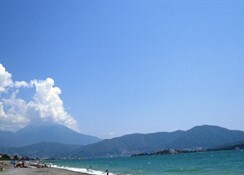 Fethiye a large town with a bustling harbour, market and a modern shopping centre is about 7 km away. Hisaronu has all the shops and night life you would need, with International Restaurants, Bars and Discos.